Welcome to the Home Pages for the Society of Brushmakers' Descendants! Many people seem to have Brush Drawers in their ancestry, and this little piece will go some way towards describing what this aspect of brushmaking actually entailed. 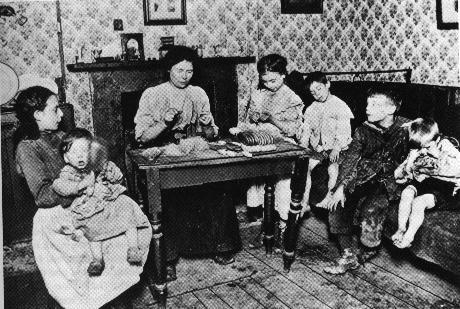 The picture above shows a nineteenth century East End of London home-working brush drawer surrounded by her children. This was part of a series taken at the time to publicise the awful conditions and hardship the working class had to undergo to earn a meagre living. My wife has a brush drawer in her tree. I assume that this is part of the manufacturing process. What did she do? Here is some information about brush drawing that I hope may be of use to another person with a brush drawer in their ancestry. Before efficient glues were invented the only way of "sticking" bristles to a brush-stock was by using hot pitch. This method was used up till this century for brooms and household brushes. It was known as "pan-work" as it entailed using a pan of warm pitch. However, this was no good for making small personal brushes as the pitch would get in your hair. Also pitch was very limited in its water resistant qualities when used with hot soapy water etc. The way around this was "drawing", and this was the first aspect of the craft a brushmaker's apprentice would be taught. In drawing, a wooden brush back is made and holes drilled though it to take the knots of bristle. This part of the brush would usually be the part that included the wooden handle. The holes were each drilled with two bits, one wider than the other so that half of the hole was of a larger bore. A length of wire or thin twine was then passed in loops through the holes from the back of the brush. A small bundle of bristles, about two inches or so long was then pushed through each loop, so that as the loop was pulled from behind the brush back the bristles folded over into the wider part of the hole and were held tight as the wire or twine was pulled. If the brush was for hair the bristles would be left slightly uneven. If it was for clothes, etc. they would be fixed so they would all be even. A brush back drilled ready for drawing. To hand-draw a good hairbrush would be a day's work! After all the bristles were inserted and the wire or twine secured a brush-back of thin veneer would be fixed over it to hide the work. These were glued with fish glue, but as this was also unreliable four small brass screws were also added to keep the back secure. The brush was then "finished"- i.e.shaped, sanded, stained and polished. This could be a specialist job and some brushmakers described themselves as "brush finishers". Brushes are still made this way today, but they are quite expensive and are usually bought by the "upper classes" or those with an eye for quality! . The sign of a top quality brush is still the four small brass screws to be found in its back. This method was also used for ebony and ivory backed brushes. The holes for the bristles were drilled for a set depth and then longitudinal holes were drilled from one end of the brush to connect them together. Connecting the holes was called trepanning, which was done with a very long, thin, flexible drill bit. The drawing wire was then inserted and the loops pulled through the holes with a minute crochet hook! As the back was so expensive this work would be done by a specialist. The brushmakers who did this work often added the material they worked with to their occupation description, i.e Ivory brush maker etc.. In 1780 William Addis invented the modern toothbrush for his own use. Toothbrushes had existed before but were just like an artists paintbrush. Addis felt that the brush would be much more efficient if the handle was held sideways. He soon realised the commercial potential. By 1788 they were in production, especially after Dr Maury of Washington D.C. perfected a way of smoothing and tapering the bone handles so they did not damage the mouth and gums. The handles were made from cattle shin-bones. By the late 19th century sixty gross (8640) of toothbrushes were made weekly by G.B.Kents, for which 600 head of cattle would be required to produce the handles, providing about four toothbrush handles per leg bone! Toothbrushes were also "drawn" in a similar way to other small brushes, and a very fiddly business it was! As a result the brush manufacturers employed lots of women (smaller fingers!) as factory staff and out-workers to carry out this job. Late 19th century you will find lots of women describing themselves as brush-drawers. By the 1890s G B Kent's employed hundreds of women, who were picked for their appearance. The toothbrush backs were now machine drilled and wooden brushes were also being made by machine, which Kents boasted could be operated by a child! The machine drilled five toothbrushes per minute, with 60 holes per toothbrush. Old illustrations show young women in long skirts and crisp blouses at work in their factories in east London, and later in Hemel Hempstead, Herts. Kents were the largest producer of toothbrushes in the world at this time! If you find a Brush Drawer in your line, it could be that she was one of these ladies, or an out-worker, or even a more traditional brush maker. Brush drawing was nearly made obsolete by the arrival of new nylon and stapled brushes in the 20th century, but the practise still clings on!